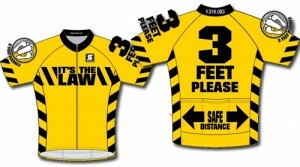 My virtual friend, Andrew, AKA Aushiker, was blogging about the 3 Feet Please jersey designed by Florida rider Joe Mizereck to encourage drivers to observe the three-foot minimum passing distance. He was trying to start a groundswell campaign in his native Australia to get a similar One Meter Law passed. I told Andrew that I like the jersey, but the Slow Moving Vehicle triangle attached to my CamelBak M.U.L.E. would cover it up, unfortunately. He asked if I could show him how I have it mounted. Wife Lila snapped this just as Son Matt and I were getting ready to dip our wheels in the Gulf of Mexico after riding across Florida. Matt and I both rode with taillights. My RealLite and Nightrider were caught between flashes, but the always-on generator light is can be seen glowing. We were on the last, short leg of our tour, so I left the panniers behind. Otherwise, you’d have seen another SMV triangles mounted on the left one. I experimented with a Flash Flag, visible above my left knee. It’s kind of lost when panniers are mounted. I had to do some playing around to get it to work on the rear of my rack. I’ll dust it off and see if I can make it work on my Surly Long Haul Trucker and give it another try. I bought mine after my eye was drawn to the flags when a couple of tourists come through town several years ago. Your lights and triangle seem more practical than the shirts. Even driving at slow speeds, cars will be past you before they can read the words. I’ve had the same problem with some of the “traffic blocked ahead” warning signs on I-95. They’re often two screens of words and I only have time to read one before I’m past them. It’s good to see that you are still wearing the “Bad Dog Jersey” (http://www.gobaddog.com/bad_dog_cycle_team.htm) although it is covered up by your slow moving vehicle signage. I will still wager that if you ever do have a “run in” with a car they will still swear they never saw you, your lights or your other warning signs. But at least you are out there trying to be visible. I am waiting for the electronic jammer that I can clip on to me that will cause vehicles to be disabled if they come too close to me, other than that, it’s all bets off. Yes, I do wear the Bad Dog jersey on special occasions. The red and orange stripes show up much better than I would have thought. As far as the “I didn’t see him” defense, that’s why I have pictures of me going down the road. When the cops testify about how many blinking objects they had to sweep off the road and photos of me in normal riding mode are introduced, I hope to make Wife Lila a rich Widow Lila. I’ve thought about buying one of those cell phone disablers (illegal in this country, unfortunately), but the driver would be so distracted by his loss of signal that he’d be MORE likely to run over me than if I let him gab ‘n’ go. Now, if I could get a device that would disable the electronic ignition system of a too-close car, THAT’D be a go. Always concerned about getting whacked, I run a Denotte 140 rear flashing tail light which is astonishingly bright. Although I’m supposed to get 12 hours on flash, I honestly get about 8 — which is enough for most days. So far . . . so good! I’ve seen the Denotte on the road and I’ve been tempted. It’s just hard for me to spend that much money on yet another light when I already have so many. I never thought these words would escape my lips, but I think the Denotte is almost TOO bright. It was just this side of painful to follow. 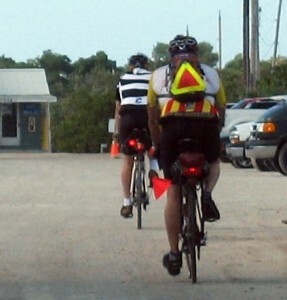 If you were in a group, you’d have to hang a sock or something over it to keep from blinding your fellow bikers. I wonder though if there is a point when you are drawing too much attention to yourself. Much like you should never stare directly at FOD in the road if you want to avoid it. If a motorist is staring at your kit, I worry that it would actually make them veer closer to you. Some states have banned blinking or flashing lights on bikes for this very reason. Not that I’m advocating going without completely, just finding a happy place. Buy two spokes (and four for spreas) and a spoke key, look on the internet for instructions and do it yourself. It isn’t hard and if you take your time it is quite easy. You can do it with the wheel in its normal place; fancy jigs are only necessary for wheel building from scratch. I agree with you Ken when it comes down to the Denotte. My uncle is forever biking and got one for his birthday. However, on a simple bike ride to the store with my cousin who was using his bike and riding in front of me. Honestly, I pretty much saw lights even after we were done riding.